Just five minutes south from the airport, Marina Vallarta, with some 355 boats moored at various times throughout the year, is the largest marina in Mexico. The majestic lighthouse features a sky bar and is surrounded by a boardwalk of restaurants, bars, fine art galleries, handcraft shops, jewelry and fishing tour vendors, it quickly became the "it" place for living when it was built in the early 1980's. With multiple gated multifamily condominiums such as Portofino, Bay View Grand, Shangri-la, Tres Mares and more; a golf course and some of the finest hotels in Puerto Vallarta (Quinta Real, Velas and Westin), the marina is a very nice place for a clam dinner or a night walk. It is still a local favorite for family living, with many opportunities for buying houses and apartments overlooking the golf course, water or boats. Between the Marina and the Downtown area of Puerto Vallarta stretches the Hotel Zone. A long beach stretch with the primary concentration of huge resort type hotels. All kinds of amenities varying from restaurants, nightclubs and shops can be found within walking distance. Featured luxury condominiums projects include Peninsula and the Grand Venetian. 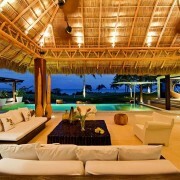 Casa La Playa in Puerto Vallarta is a superb study in elegant simplicity set on the beach in a tropical paradise. 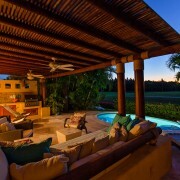 Majestic five bedroom hacienda on the golf course in Marina Vallarta, nine bathrooms and full maid's quarters. 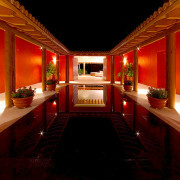 Central courtyard, pool and service room. 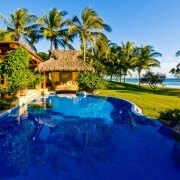 Puerto Vallarta hotel providing luxury Puerto Vallarta accommodations once owned by some of Mexico's most prominent families. Here, where the majestic Sierra Madre Mountains embrace the azure waters of Banderas Bay, vacationers can revel in a beguiling blend of colonial charm, outdoor activities and superb Puerto Vallarta accommodations unparalleled on the fabled Mexican Riviera. This fabulous boutique hotel in Mexico offers Puerto Vallarta luxury villas that exemplify all that's stylish about living in Mexico.